A mashup of the savory kimchi jeon and okonomiyaki. Chef Eric Ehler shares his recipe. For National Adoption Month, we bring you a story about the rise of Korean adoptee chefs like Eric Ehler. Ehler was Sous Chef at Serpentine in San Francisco and founded Seoul Patch, a pop-up restaurant. He is currently the Culinary Director of the San Francisco-based food delivery company, Luke’s Local, and plans on opening a restaurant in the near future. Ehler was adopted from Korea around age one and grew up in a small town in Iowa. He began cooking professionally at 17, but really began putting together dishes in the kitchen at age 6. Ehler shares his recipe for pajeonoyaki, a delicious mashup of two savory Asian pancakes: the Japanese okonomiyaki and Korean kimchi jeon. Chef and Korean adoptee Eric Ehler hangs out in front of a Sushi-Ya in Taipei. Photo credit: Pete Lee. I’m torn between my love of Asian pancakes. From the crispy banh xeo of Vietnam, to the gloriously messy okonomiyaki of Osaka, I just can’t get enough. The western world is stuck in a sweet pancake world, but they’re really missing out on the possibilities of the savory pancakes of Asia. One of my first introductions to Korean food was through a kimchi jeon. It was delicious, crispy and savory. 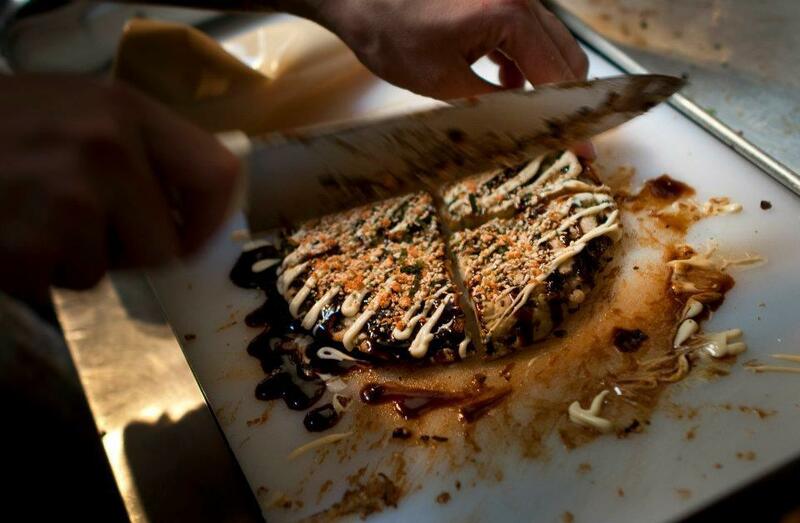 However, not being able to settle on doing something “run of the mill” or “normal,” I decided to mash it up with its Japanese cousin, the okonomiyaki. It was easy too since I was running my pop up, Seoul Patch, out of a Japanese restaurant. I had all the ingredients for the regular kimchi jeon. All I needed was a few Japanese pantry staples to really seal the deal. I added in some bacon to really make it shine. This one is a winner. Start by chopping your kimchi. If it is already chopped, you’re one step ahead. Add it to a mixing bowl, along with your flour, starch, baking soda, and soda water. Mix with a whisk or spatula, until it all comes together. You’ll have about 2 cups of batter. Be careful not to over mix; for some reason an over mixed batter will yield a strange textured pancake. I recommend using an 8 inch non stick pan, but if you have a bigger one, you can make smaller pancakes. An 8 inch will yield a perfect sided pancake. Heat a non stick pan up with oil, to medium high heat. Add in your scallions and chopped bacon, and lightly fry, until the pan becomes smokey and aromatic. Once the bacon is kind of crispy, and the onion has sweated out, add in a big ladle of your batter. Using the ladle, evenly distribute batter in the pan, making a nice circular pancake. Let the pancake sizzle, and make sure that there is enough oil in the pan. You don’t want to be submerging it in oil, but you’ll want some excess around the edges to make it crispy. Once you see bubbles forming on top of the pancake, it’s time to flip. You can either flip it in the pan manually, or use a spatula. You’ll probably want to use a spatula. Flip the pancake, and fry it for another minute or so. Use a spatula to check the bottom, and make sure its not getting burnt. Adjust heat accordingly. After both sides are browned and crisped, transfer pancake to a plate, lined with a paper towel. Drain and pat dry of any excess grease. To serve, put on cutting board and cut into a 6 even pieces. Drizzle with kewpie mayo and bulldog sauce. Top with furikake and katsuobushi. Eat immediately! And eat with either Hite or Asahi. Or any other light Asian lager, for that matter. Enjoy! This post is a part of Off the Menu: Asian America, a multimedia project between the Center for Asian American Media and KQED, featuring a one-hour PBS primetime special by award-winning filmmaker Grace Lee (American Revolutionary: The Evolution of Grace Lee Boggs), original stories and web content. Main image: Eric Ehler’s Japanese Korean pancake “mashup,” the pajeonoyaki. Photo by Rebecca Lee.